– There are certain cartoons that become cellophane symbols of a generation – the Simpsons, the Smurfs, South Park. 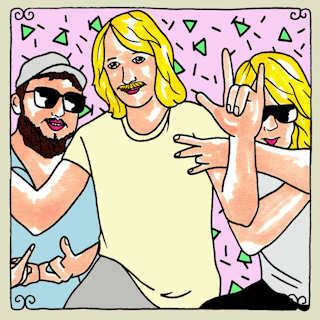 Now there’s an odd contender: the Daytrotter treatment, a spare, fluorescent illustration bestowed upon artists lucky enough to recieve a session on the cultish website. Natural Child just joined the ranks (that’s their drawing, at left) and did their own at Nashville’s Big Light Studios. Check it out here. – A spontaneous re-viewing of Heartworn Highways inspired us to head to the Steve Earle show at 3rd and Lindsley on Saturday, and the decision was a smart one. While younger disciples (including Earle’s own son) get the attention, Earle cranks out tunes to make his mentors (like Guy Clark and Townes Van Zandt) proud. Next up? A new record out in February, recorded in Nashville at Ben Folds‘ own studio. – The good folks of Kopecky Family Band premiered a single, “Heartbeat”, on Rolling Stone today, which you can download here – and will appear on their forthcoming debut full-length, Kids Raising Kids. We’ve been lucky enough to preview it and can’t say too much quite yet, but you’re in for a real treat. In the meantime, grab your Soundland tickets and catch them live. – One of my favorite under-appreciated-outside-of-California LA bands, Lord Huron, is stopping in Nashville on 9.29 at the High Watt. They will release their first full-length on 10.9. Tickets are still available, so grab them now. – Stars is playing Mercy on 9.29 – check out an NPR first listen of their upcoming record, The North, here. – P.S, thanks for all the nice feedback on my Nashville Five. Really appreciated the notes and letters – so glad it resonated with some of you. Previous Entry Nashville Five /// Me.